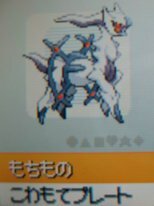 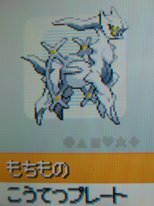 Arceus is the final Pokémon in the National Pokédex in the fourth Generation. 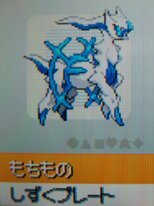 Being called the Creation Pokémon, it is thought to be the God of all Pokémon. 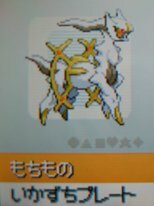 Being a god requires it to be incredibly powerful, which of course it is, with the highest base stat total in the entire history of Pokémon. However, its trademark ability is a rather interesting one which involves form change is to explain all of the forms and use display them for you to see. Throughout the game, you will find certain Plates that look like the picture to the left. Thesee plates serve no other purpose so be sure to store them. 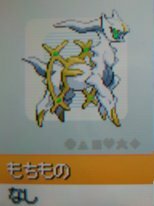 Each time you get one, you're able to unlock another piece of the Myth about Arceus, which will be posted here once we've finished translating. When these Plates are attached to Arceus, his colouring shall change and as will his type. With his stats and massive movepool, this is an incredibly handy thing for Arceus.